“But” is basically a negation. It means, “I don’t support whatever it is that I’m ‘butting’.” And I have to admit that it pisses me off. This is an offensive and blasphemous image. It hurts me a little to publish it. But the right to publish it is more important than my feelings, or the feelings of anyone else who is offended. 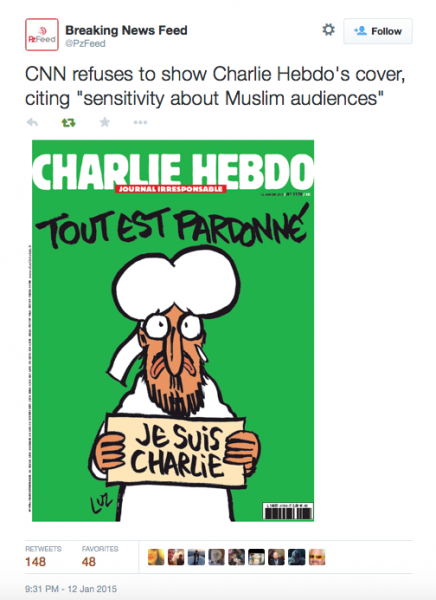 The Charlie Hebdo cartoons were offensive. No question. I don’t much like insults and mockery, whether directed at individuals or at groups. BUT–and this, folks, is the RIGHT way to say “but”–it doesn’t matter. Hate speech is free speech, and if you’re not free to insult and offend, you’re not free. So I’ve included a bit of hate speech with this post: an image of Muhammed bathing in blood. I admit I really dislike this image, more than “Piss Christ,” even. BUT: Today, it’s more important that I assert my right to be offensive and blasphemous than it is for me to worry about the sensibilities of my Muslim friends. Want me to stop publishing offensive cartoon? No problem, just, you know, stop killing people over cartoons. The right way to say “but” isn’t limited to mockery of religion or support for free expression. I don’t need an AK clone for hunting (not that it’s a terrible choice for whitetails, but I surely don’t “need” it). I’m not going to argue that I do. BUT–I have the right to own it, both because hunting isn’t the purpose of the Second Amendment, and because, unless you’ve got some really compelling reason to boss me around, then you can shove off and mind your own business. I don’t appreciate the lies that the gun-banners tell about me, about my friends, or about the laws they want passed. BUT–they have the right to their opinions, and to express them, however ill-informed. Stop saying “but” to freedom. ANYBODY’S FREEDOM. Start saying “but” to the people who would take our freedom, whether those be gun-banners, college campus “hate speech” police, or murderous terrorists. The MSM is composed of cowardly losers, but there’s no reason we need to follow their example. And finally to the cowards at the NYT, at CNN, at any other organization that refuses to publish the new Charlie Hebdo cover: I am not eloquent to express the depth of my contempt. They’ve got enough courage to publish it AFTER their colleagues were murdered. You can’t manage even that small stand for free speech. Pretending you’re worried about “offending” people is nonsense and we know you’re lying. Grow a pair.